IronCAD is getting a lot of attention these days, adding TraceParts, integrating GrabCAD, and more recently, adding KeyShot. To see what all the fuss was about, I figured I’d open up the software and take a look inside. I’m not entirely new to IronCAD. Back with IronCAD version 1 in the 90s I witnessed it doing direct modeling (history-free), long before most CAD users knew they needed it. More accurately, IronCAD did both history and direct modeling back then, as it always was a hybrid molder. Before then, it was known as Trispectives with its Tri-Ball user interface, which is still present today. So, here we are today with IronCAD version 2014 and a host of new features. I could write an entire series of articles to cover the features of IronCAD properly. But for now, I’ll touch on some of the new and core features that are generating attention. I’ll start in this software review with the user interface, supported file types, and large model handling, and then I will highlight functions new to IronCAD 2014, including TraceParts, KeyShot, GrabCAD, and point clouds. In figure 1 I identify a few key interface elements, such as the Tri-ball, the Catalog Browser and Scene Browser. This is a how IronCAD 2014 looks right out of the box, with exception of the menu bar I turned on. While some of these UI elements are common among mid-range CAD programs, a few are unique. Take the Scene Browser, for instance. A scene is not a part or assembly; it’s both. I like that, especially for making conceptual models. It lets me make part after part quickly, without having to decide on a CAD file name or its location. At any time, I can group parts into assemblies and even disassemble at will to alter the structure to my particular needs. Having all of the parts in one file has its advantages; I can save out any specific part/assembly as desired. Another unique element is the Tri-Ball. It is first of all a positioning tool, but it also pushes, pulls, and stretches faces, parts, and assemblies. It can even copy and pattern (array) parts and assemblies – very powerful. While other vendors have tried to copy this tool, the original Tri-Ball takes the cake. Before moving on, I should also mention the Catalog Browser. It makes conceptual and production modeling a snap – literally. We designers drag and drop these features and parts into the scene, and then quickly resize or position them with handles and the Tri-Ball. Even sheet metal features exist there in the catalog. 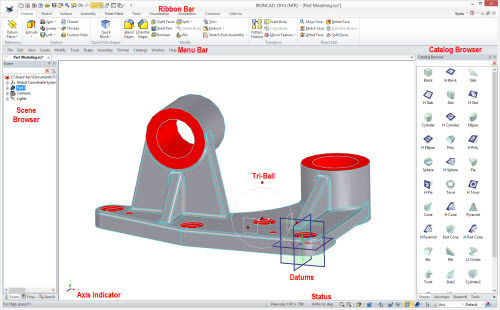 Even better, IronCAD’s Smart Assembly capabilities lets me place objects with intelligent behavior, such as automatic positioning and orientation; I could see this making it quick and easy to build configurable products. IronCAD is robust when it comes to supporting non-native file types. This is done through a very reasonably-priced add-on called IronCAD-Trans that offers read and write capability for CATIA files, as well as reading files from NX (nee Unigraphics), SolidWorks, Pro/E, Inventor, and others. 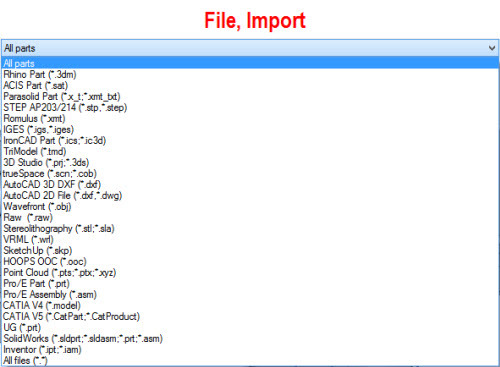 Figure 2 lists the supported file types when opening a new document. This is augmented by the selections available in the import dialog box (see figure 3). The difference between the two is that File | Open handles native and 2D formats, while File | Import works with non-native 3D formats. One format that I noticed missing is JT, an interchange format championed by Siemens PLM. It is commonly used for visualization 3D models in viewers, but can contain solid model information. I’ve alerted IronCAD that users need this format – with no increase in price, of course! IronCAD can more easily handle many different file types because it is a dual kernel CAD program. Both Siemens PLM’s Parasolid and Dassault Systemes’ ACIS are built in. IronCAD is the only company to offer this. It seems to me that this would put them in a higher price bracket (due to the added licensing cost), but the opposite is true as IronCAD is priced lower than most other mid-range MCAD packages. To try out IronCAD 2014 practically, I went ahead and opened a large automotive component (see figure 4). The component is in a STEP file weighing in at just over 300MB – perhaps not gigantic by today’s standards. With its default settings, IronCAD opened it in under 30 minutes on my store-bought i7-based laptop (i.e., hardware not optimized for CAD). There are options that improve the import and file save times, depending on what you plan to do with the imported data. For example, when using an imported model as a reference, it opens it more quickly than a fully editable imported model where more data is required. Ignore the tiny gaps you see in figure 4 between surface areas. These can be tuned out in the graphics performance dialog box; they went away completely when I zoomed in closer. The conversion was sound, in my judgment. IronCAD saved the file in 2 minutes. By comparison, SolidWorks opened the file in 12 minutes, but then took 12 minutes to save it. One function new to IronCAD 2014 is TraceParts, a Web-based content center that offers over 100 million 2D and 3D CAD parts free. The parts are sourced from a host of manufacturers, such as 3M, Rexroth, DME, Swagelok, and Parker. At the time of writing this, I counted almost 500 manufacturers. To test it out, I put together an assembly in IronCAD. 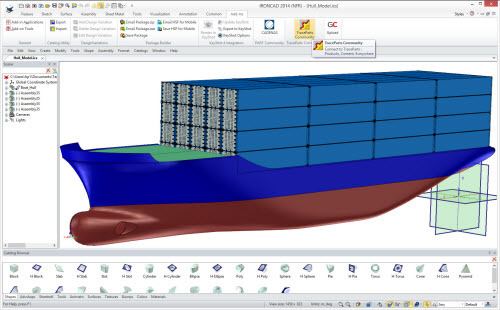 The hull math data I created in Rhino, but the shipping containers I got from TraceParts (see figure 5). From within IronCAD, access to the TraceParts site is launched from the Add-Ins tab on the ribbon. This launches the TraceParts site and then reduces its content to sections and mechanisms that deliver parts for rapid insertion into IronCAD. One drawback: the first time I used it, TraceParts required a lengthy registration process, at least by my standards. 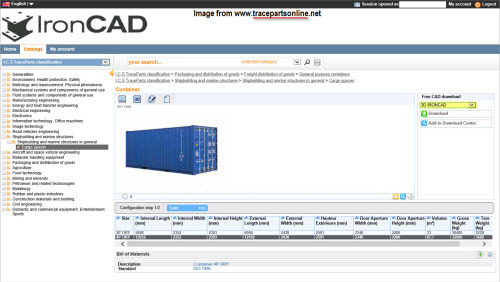 The screen grab in figure 6 shows the TraceParts for IronCAD with the I.C.S. parts categories, and the 40′ shipping container I retrieved. I found the 3D model in good shape: it was made of solids with anchor/snap points to assist in placement. I initially tried to import the hull as a native Rhino 5 file, but had trouble and so translated it through IGES. I since learned that I created the problem when I removed the 32-bit version of Rhino from my machine. 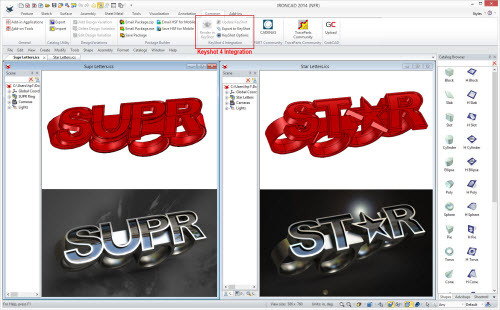 For IronCAD to import Rhino files, it needs both the 32- and 64-bit versions installed on the same computer. KeyShot is arguably the fastest and easiest-to-use CPU-based rendering software available today. And with 2014, it is tightly integrated into IronCAD. Keep in mind that it is sold as an extra-cost addition to IronCAD and so is not included in the base package. Once I initiated the link up from IronCAD’s Add-ins tab, KeyShot opened and loaded the current model. Thanks to the integration, I could update my IronCAD model and then see the update rendered in KeyShot. The entire file structure is preserved in KeyShot, which means that I did not need to reassign materials or lights that were done in IronCAD. Figure 7 shows are the simple controls that govern KeyShot in IronCAD. IronCAD and KeyShot make a powerful combination for jewelry design and rendering. But while KeyShot is known for producing stunning results at the click of a mouse, to produce renderings like the one shown in figure 7 you need knowledge of lighting and other studio environments. I find it helps to have knowledge of Photoshop or similar software for composing the final rendering. GrabCAD has become one of the premier communities for sharing 3D CAD models. It recently added Workbench through which to share files privately and to work together with partners. GrabCAD required that I set up an account (which is free), and then I logged in. With a few mouse clicks, my IronCAD models were ready to be shown off to the rest of the world. Their uploader automates nearly all the work: it grabs the active IronCAD model and exports it in JPEG raster and .x_t Parasolids vector formats. Along with the IronCAD .ics model, it makes all three files available for download by others instantly. IronCAD uploads to the community or to workbench projects. Here is how they differ: when uploaded to the community, the models are open to all users to access; when uploaded to the workbench, I am required to invite others collaborate, because that’s the purpose of the workbench. 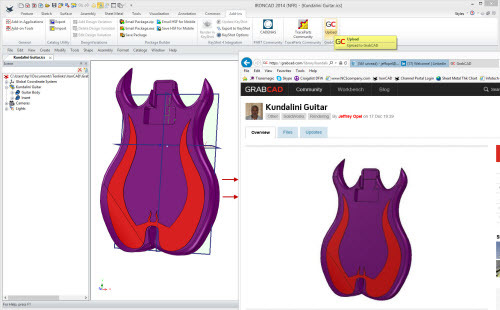 Figure 8 shows GrabCAD’s integration into IronCAD. 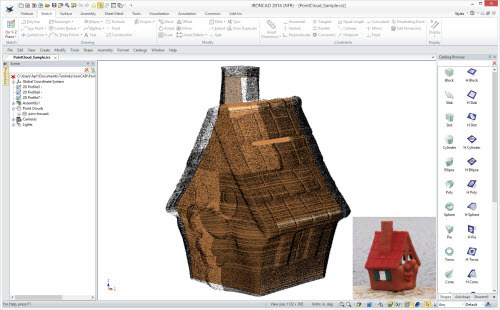 Also new to this 2014 release is the ability of IronCAD to read point cloud files. These are large collections of x,y,z point coordinates that result from 3D laser scanning equipment. Another use is to read in point coordinates generated from a program like Excel to draw splines and other complex shapes. There are many more IronCAD features that I would want to write about, but to end off I wanted to describe the parts of IronCAD Design Collaboration Suite (see figure 10). INOVATE is IronCAD with fewer capabilities. For instance, it creates assemblies but all files must be in the assembly file or scene; they cannot be externally referenced. No 2D. You can add TRANS to INOVATE for a low cost, high power viewer, translator, and 3D part modeler. DRAFT is an AutoCAD-like standalone 2D production drafting program with some 3D integration capabilities. It reads and writes DWG files and offers many commands used by AutoCAD. In addition, it imports 3D models and references them in 2D layouts – a unique function, I feel. COMPOSE is a visualization tool meant for presenting designs to customers and others who don’t need CAD editing. It handles IronCAD and other CAD file types for presentations, assembles and explodes parts, scales them, and hides and sections them. It is free. IronCAD is a mature and robust solution that (a) offers two modeling kernels and (b) uniquely mixes parametric feature modeling and direct editing within the part structure. This gives designers the best of both worlds: design intent and the freedom to change when and where needed. Plus, it includes a host of features that cost more in other mid-range CAD products, such as sheet metal, surfacing, animations, rendering, and drafting. 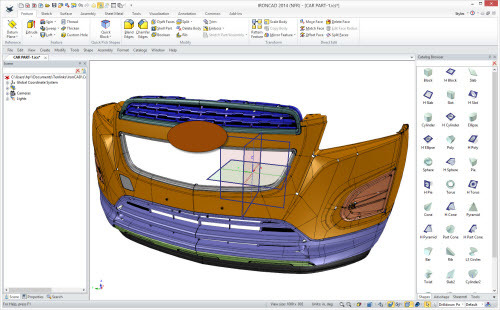 FEA (finite element analysis) is available as an extra-cost add-on. The price of IronCAD is $3,970 in the USA.